Nautical by Nature: Can you guess where I am this weekend?? Wearing my FAVORITE Pink Pony sweatshirt that someone STOLE off my bag at Dulles airport. I am still mad! I am 10 posts away from 600 posts! And 20 followers away from 500 followers. You know what that means! OMG Vegas... I love Vegas. Have fun and stay cool! Oh and the Marshall's and TJ Maxx I went to were both in Henderson...I know there is a Marshall's on Tropicana Ave though so it will be closer for you. I got a Lilly dress at Marshall's for $30, but I didn't see much else in the way of LP or VV. But the prices are so much cheaper on everything!!! I figured it out at the fake sky pic. Have a blast!! I had no idea. Take pity on one who has never been. Post more photos:). Have fun in VEGAS! I can't wait to hear about your trip. I really want to go to LV one day! Jealous!! LOVE that chihuly ceiling!! Oh I know! I know! LAs Vegas! So so fun! 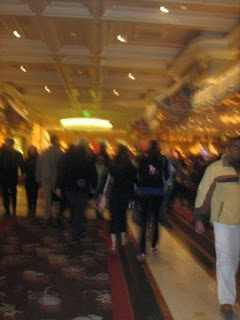 I love Vegas, we always go around my birthday each year (November) but man I cant imagine going in the summer time. I love the glass flower ceiling! I have the exact picture in my room. vegas baby! love it have fun and play a little keno for me doll! Someone stole your hoodie and wore it in front of you? Oh my gosh! Manatee's Headband- that's just an old photo from back before the hoodie was stolen. I never found it! what happens there stays there! congrats on your posts and followers!!!! yay! vegas is the best! how grossly hot was it? ?